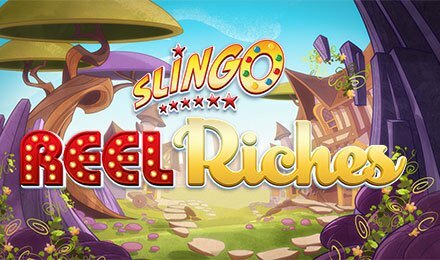 Play Slingo Reel Riches & Pick Your Own Free Spins! Slingo Reel Riches is one of the most unusual variations of the popular Slingo games. It is also possibly the most rewarding one too. The game deviates from Slingo’s bingo roots and veers towards elements of the game more common in casino slots. It is a 20-payline, 5-reel game that is more or less like a slot game. In fact, it is more or less a slot game with all of the best known Slingo characters. By leaning more towards slots, Slingo Reel Riches has more advantages that classic Slingos. You get bigger prizes, more bonus features and extra Wilds. In addition to that, traditional Slingo online games have a theoretical RTP that averages out at 95%. However, this game has a higher RTP of 95.93%, which means that players get higher returns on their bets. Layout of the Game: Unlike other Slingo variants, this game does not have the bingo grid. In fact, it looks like a regular slots game. You have 5 reels just as you would in normal slots. However, the game plays like a Slingo, wherein you have to choose your wager and spin the reels the same way. The overall look of the game is great. Slingo Reel Riches plays well too. Pay table: This online Slingo game has a pay table just like a slots game, with all the winning combinations and their pay outs listed there. Placing Your Bet: You have a choice of 8 different wagers: 20p, 40p, £1, £2, £5, £10, £25 and £50. Start the Game by clicking on SPIN. Like slots, winning combinations are made with 3 or more matching symbols, from the left to the right. .
A stack of coins is the Wild. You also have familiar Slingo symbols like the Joker, the Super Joker, a Fairy (which is the Cherub in classic Slingo) and the Devil. You also have 5 playing cards – the royals (A, K, Q, J, 10). There is also a Bonus symbol. Of these, the most valuable are the Joker and the Super Joker, and if you manage to land 5 of them on a payline, you win 1600x your original bet. The next most valuable symbol is the Wild, which has a 1000x pay out. The Wild can substitute any symbol on the reels, with the exception of the Bonus symbol. The Wild will also double your wins. There are two types of Bonus rounds in Slingo Reel Riches: Win Spin Bonus and Wild Spin Bonus. One leads to the other. - To activate the bonus round, you need to land 3 or more Bonus symbols on the reels; they do not need to be on a payline. - When this happens, you trigger the Win Spins bonus, where you are guaranteed wins. - This bonus gives you a chance to win as much as 1000x your base bet. This amazing Slingo version has loads of bonuses so stay on the lookout!